There are many ways to plan a wedding on a budget. I made a post recently about that, but what if you are looking for even more ways to save money with your wedding? We are now deep into our wedding planning, with just a couple months to go. Our budget was for us to spend less than $15,000 for our over 200 person wedding, and now that we are nearing the end I can honestly say that I believe we will be under this budget. This required a lot of work though. We both want an outdoor wedding, and no matter what anyone tells you, they can be more expensive than a wedding at an actual venue. Yes, we are using a family property (in his family, there is an estate property consisting of over 200 BEAUTIFUL acres of land), but there are many expenses that go into planning an outdoor wedding on a family property. Due to the high expenses, we have looked at every single way for us to possibly save money. 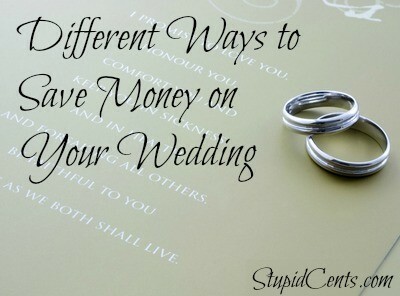 Here are four different ways to save money on your wedding that you may not have thought about. I have bartered many, many services in exchange for free wedding products and services. We are getting our DJ ($1,000 value), invitations, programs, cards, Save the Dates ($1,000 value! ), wedding cake topper ($300 value) and probably 25 other items at a significant discount or FREE because of the bartering that I have done. I’m sure that there is some sort of service that you could offer in exchange for free product in return. I know, I know. Many people are against choosing anything besides a diamond, but I think that there are many other beautiful alternatives. I have seen many beautiful Morganite and Moissanite engagement rings that have made me swoon. A Moissanite ring may only cost $1,500, whereas the exact same equivalent in diamond form costs $20,000! Wedding dresses can be astronomically expensive these days. After I bought my wedding dress, I looked online (because I love looking at wedding dresses) to see what I could have bought with my money. I found many great deals on wedding dresses.You can find many $5,000 wedding dresses in the $3,000 price range. You can find $1,000 dresses in the $200 to $300 range. I did find my dress online, but it was never at a discount. I guess they didn’t make many of my wedding dress so it’s been in high demand. I have heard many people complain about why they would never buy a pre-owned wedding dress. However, before you put the idea completely down, you need to really think about it. You are only going to wear this dress once, do you really want to spend half your budget on your dress? Also, many of the dresses on pre-owned websites have never been worn – the bride just decided that she wanted something else instead. At some venues, you may be able to supply your own liquor, which can mean a significant amount of savings. Of course, check with your venue and local laws, as this may dictate if that is possible or not. I have seen weddings where the bride and groom supplied all the liquor and hired a bartender for around $200 for the night. Instead of spending $20 a head for 4 hours of open bar, you could instead buy the alcohol yourself and save thousands. I have also heard of weddings where the drinks were basically self-serve. Of course, if there are children at the wedding then this may not be the best idea. How did you save money with your wedding? Great tips! One of the things I’ve decided to do is only pay for things that are truly important to us. Aside from making sure that our guests have basic comforts – food, beverages, and access to bathroom facilities – everything else is a “want,” for the wedding, not a “need,” so I won’t let anyone tell us we “need to have this for a wedding!” if it’s not something personally important to us. When I get married, I’m going to try to save as much money as I can. I don’t need to spend a fortune to have a luxury wedding. I think that I will also be married at a family property.